(Bloomberg) -- Analysts are casting a skeptical eye on reports the Trump Administration is working on a proposal that would recommend freeing the mortgage-finance giants Fannie Mae and Freddie Mac from government control. 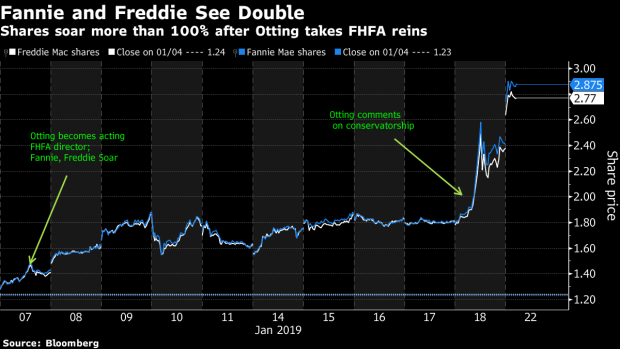 Those doubts are, for now, however, showing few signs of curbing share gains: Fannie is extending Friday’s rally to rise 18 percent in early Tuesday trading, while Freddie gained more than 16 percent. Both are at the highest since December 2017.